According to the World Health Organization (WHO) instances of obesity are on the increase in the United Arab Emirates. In 2005, over 75% of women over 30 in the United Arab Emirates were classified as overweight, with similar estimates for men. (4) The adverse health outcome of excess weight places an increasing burden on our health care system. (5,6) Being overweight is highly resistant to intervention(7) and it is doubtful that we are any closer to a solution today than we were decades ago. In fact, we appear to be moving away from, rather than towards, the national objectives according to data from National Health and National Examination Survey, NHANES III. (8) Until now, no intervention has been shown consistently to achieve true weight control. Although the precise reason for the high relapse rate is not known, the stunning uniformity of these findings, which now extend over nearly five decades, should give pause to anyone who proposes to treat, much less cure, obesity. (9) However, recent advances in technology show that obesity is associated with a low-grade inflammation of white adipose tissue stemming from the chronic activation of the innate immune system leads to further weight gain, insulin resistance and diabetes. (10) As food intolerance/sensitivity is one possible cause of this low-grade inflammation, we decided to investigate the hypothesis that the adherence to a food intolerance elimination diet improves weight in refractory patients. The method used for determining the diet related triggers of this inflammation in this study is the Alcat Test. The Alcat Test uses a specially designed particle counter (hematology analyzer with an automated assay sampler) and food test agents to semi-qualitatively measure white blood cell reactivity, if any, to each agent analyzed. The degree of reactivity is determined by comparing a baseline distribution curve (of the white cells) against the distribution curve generated by the analysis of each test agent/blood sample, and calculating the absolute differences between the curves and the standard deviation (SD). Any reactivity under SD1 will be considered as non- reactive (NEG); reactivity between SD1 and SD2 will be considered as marginally reactive (RANGE 1+); reactivity between SD2 and SD3 will be considered reactive (RANGE 2+); and finally, reactivity above or equal to SD3 will be considered markedly reactive (RANGE MPOS). Despite mounting evidence of the efficacy of the Alcat Test in reducing obesity and the overall activation of the immune system, there have been no studies of the weight loss benefits of the Alcat Test reported for an Arab population. The purpose of this study was, therefore, to determine the effectiveness of the Alcat Test as a weight loss tool in Arab patients who had experienced difficulty achieving goal weight by calorie restriction. This study was designed to determine whether people who could not lose weight on a low calorie diet could achieve their weight loss using the results from Alcat Test. A group of 27 patients with 14 males and 13 females with mean age of 42.77± 6.23 Years and with mean height of 168.66 ± 2.09 cm with obesity who had difficulty losing weight when they adhered to a reduced calorie diet were evaluated for specific white blood cell food induced reactions. 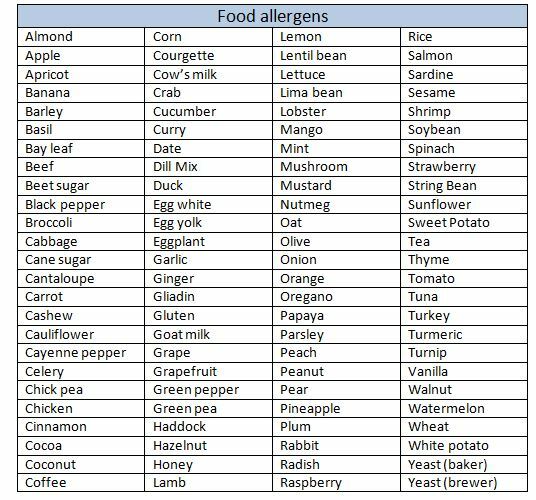 (Table 1) Patients were exhibiting multiple symptoms including: obesity, gastrointestinal reflux, chronic fatigue, headache and other chronic disorders associated with food sensitivities. Citrated blood is diluted 1 in 5 with buffer and approximately 90?l is added to each test agent well. The test agents are diluted preparations of food extracts (standardized for potency) bonded to the bottom of the well. Following 45 minutes incubation at 37 ° C with constant agitation, the test agents are incubated for a further 30 minutes at room temperature. Red cells are lysed by adding an azide free, electrolytic solution containing an lytic reagent, “ALCALyse”, supplied by Cell Science Systems, Ltd. Each test agent is then analyzed in sequence using the ROBOCat II particle counter (also manufactured by Cell Science Systems, Ltd.) with one control for every 10 food items tested. The 100 foods tested are shown in Table 2. The basis of the Alcat Test is the measurement of changes in white blood cell size/volume following incubation with food and other test agents using the ROBOCat II linked to a computer. Contact between foreign entities and whole blood can cause autolysis, a phenomenon known as autocytotoxicity, and other cellular reactions. There are three mechanisms which cause this phenomenon, and one does not require the priming of cells in vitro by either antibody or antigen(17). It was on this basis that an automated method was sought which would not only be reproducible and objective but would directly correlate with in vivo food challenge. The computer is programmed to compare cell cultures incubated in the presence of food agents and measure a shift in cell volumes related to exposure to the test agent. In keeping with standard laboratory practices, deviation in the test histograms, when compared with a control (identically treated but lacking the test agent) that exceeds one standard deviation (SD) is regarded as a positive reaction, and the patient is advised to avoid that food. 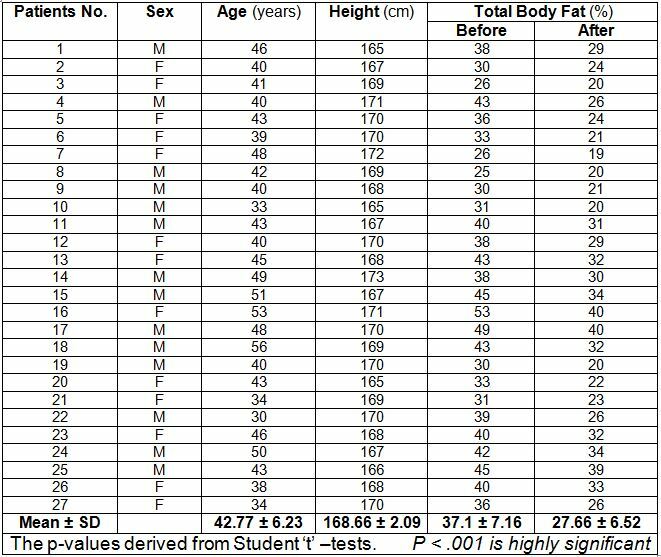 Twelve weeks after following the Alcat Test diet plans, we observed a significant decrease in Body weight, Total Body fat percent and Body Mass Index. Body weight was decreased significantly from 91.37 ± 10.56to 74.6 ± 6.76 kg, Total Body fat % was decreased significantly from 37.1 ± 7.16to 27.66 ± 6.52 % and Body Mass Index was significantly decreased from 32.1 ± 3.8to 26.1 ± 2.63 kg/m2. In this study, we demonstrated the beneficial role of Alcat Test in obesity. Correlations between obesity and Alcat Test results were positive and significant in these patients. All these patients had difficulty losing weight when they adhered to a reduced calorie diet; this study confirmed a greater weight loss in patients when they were placed on a diet plan according to the Alcat Test results. Also, the weight loss was mostly fat. Other interesting observations included, a better sense of well being and improved physical performance, improvement in abdominal bloating and digestive problems. These findings are significant because many overweight patients find it difficult to lose weight by cutting calories alone. This study suggests that delayed food hyper sensitivities may interfere with weight loss regardless of calorie restrictions. Also the beneficial effects of improved sense of well being and improvement of gastrointestinal conditions were observed collateral benefits consistent with an overall normalization of immune activity. Obesity is a major public health problem among local Arab societies and more recently, among Asian countries as well. The associated health risks and diseases present a tremendous drain on the economy and affect the quality of life. The most effective program’s for losing and maintaining a desirable body weight with careful monitoring of proper diet should be implemented holistically to ensure a successful weight reduction program. Individuals need to be aware of the many myths and misconceptions surrounding weight control. Most ‘miracle agents’ for weight loss do not have a scientific basis. 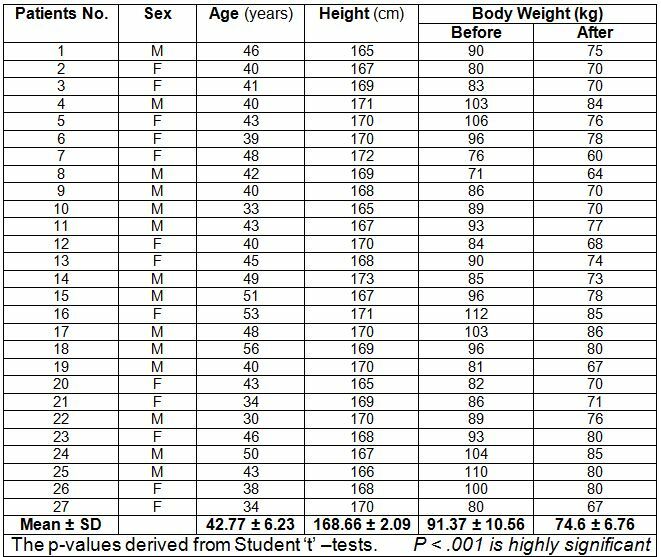 However, these data provide compelling evidence for the effectiveness of the Alcat Test diet plan in producing a positive change in body weight, body Fat and BMI and self reported disease symptoms. Thus our results confirmed the value of Alcat Test and the elimination diet in alleviating symptoms such as obesity, gastrointestinal reflux, chronic fatigue, headache and other chronic disorders associated with food hyper sensitivities. We greatly acknowledge Haji Saeed Ahmed Al Lootah, Chairman, Islamic. Establishment, for his continuous encouragement and support throughout this study. 2. Center for Disease Control and Prevention. 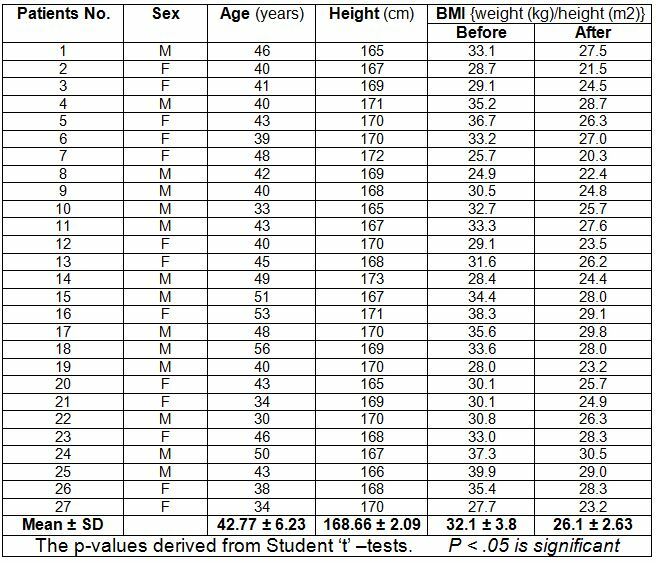 (2007) Overweight and Obesity. Retrieved on June 11, 2008 from: http://www.cdc.gov/nccdphp/dnpa/obesity/defining.htm. 4. World Health Organization (2005) The World Health Organization warns of the rising threat of heart disease and stroke as overweight and obesity rapidly increase. Retrieved on June 4, 2008, from: http://www.who.int/mediacentre/news/releases/2005/pr44/en/index.html. 5. Pi-Sunyer PX. Health implications of obesity. Am J Clin Nutr 1991; 53:15955-16035. 7. NIH Technology Assessment Conference Panel . Methods for voluntary weight loss and control: Technology assessment conference statement. Ann Intern Med 1993:119:764-770. 8. Kuczmarski RJ, Flegal KM,Campbell SM, Johnson Cl, Increasing prevalence of overweight among US adults; The National Health and Nutritional Examinations Survey, 1960 to 1991. JAMA 1994; 272:205-211. 9. Bennet WI. Obesity is not eating disorder. The Havard Mental Health Letter 1991; 8:4-6. 12. Cabo-Soler, J.R. Comments on Diets in Esthetic Medicine. Presented at: The 14th Mediterranean Day of Esthetical Medicine & Dermatological Surgery. Venice, Italy, 22-23 September, 1995. 14. Neetling WML, Kachelhoffer AM. Reproducibility of the Antigen Leucocyte Cellular Antibody Test (ALCAT). Study conducted by the University of the Orange Free State in Bloemfontein, South Africa, Jan – April, 1998. In Publication. 15. Brostoff, Jonathan., Fell, Peter J., Pasula, Mark J. High Correlation of The ALCAT Test Results With Double Blind Challenge (DBC) in Food Sensitivity. Presented at the 45th Annual Congress of the American College of Allergy and Immunology, Los Angeles, CA, November 12-16, 1988. 16. Fuglerud P. Study of the ALCAT Test in 10 subjects. Final Statistical Report. Statistical Report: 99072 conducted by Parexel Medstat, Lillestrøm, Norway. November 24, 1999. 17. Podleski WK. autocytotoxic phenomenon in bronchial asthama. In:Intrinsic Asthama. Basel: Birkhouser-Verlag,1989.